My wife is very satisfied with her jacket. Her only complaint is the lack of a loop for hanging on a peg! A well made rain jacket that's a good length. The zipped pockets are generously cut and the hood is well concealed in the collar when not required. Very smart, as well as practical. A smart stylish jacket of a good length and very suitable for wet weather. I bought my usual size 12 but had to change for a size 10 which is still roomy. Zip front style with front studded storm flap fastening for extra protection. Integral hood, zip pockets, adjustable hem and waist drawcords. 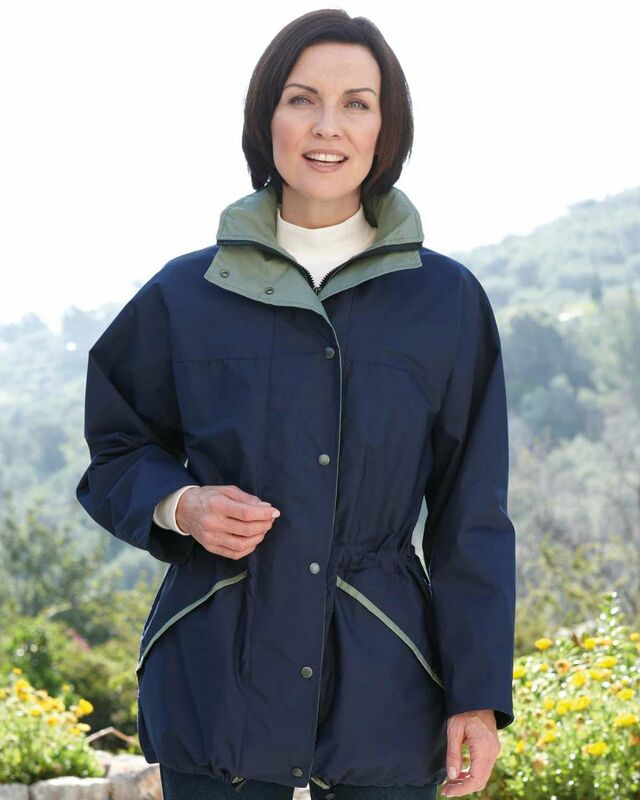 With inner taped seams, this jacket is waterproof yet breathable. When the weather is not at it's best this jacket is the perfect garment to keep you warm and dry whilst staying stylish and elegant. "My wife is very satisfied with her jacket. Her only complaint is the l ..."